Super Skunk has brought delight to lovers of cannabis since 1990, thanks to its superenergetic, super power, superaroma qualities. 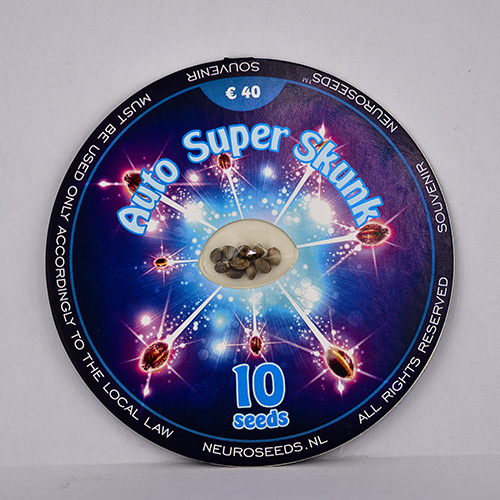 The best features of the world-famous Super Skunk were mixed by Neuro Seeds geneticists and neuroscientists with energetic varieties of Ruderalis to create exclusive auto-flowering feminized cannabis cultivar. Our Auto Super Skunk seeds even in the hands of less experienced growers can give excellent yields of solid, sparkling inflorescences. Auto Super Skunk produces a consistent growth pattern and excellent structure of inflorescences. It is short and compact, producing large colas, consisting exclusively of sticky resin cups. Its buds are sweet, very resinous and giving serious effect - an immediate and powerful cerebral effect followed by penetrating durable bodily "stone", thanks to 80% content of Indica, almost 20% of THC and CBD 0.30%. We recommend this variety for medical use to relieve the symptoms of depression, absence of appetite, nausea, pain, stress, anxiety, attention deficit hyperactivity disorder, asthma and hypertension.